Every gardener knows that good fruit is, in part, dependent upon the presence of good soil. But other factors are also important in the production of good fruit. The plant must be free of disease, receive water and sun, be planted in a warm environment, be properly pruned, and have space enough to grow. When all factors are present, good fruit is guaranteed. So it is with our lives. The soil in which we are to be planted is the mercy of God. And this soil is the richest soil attainable for the production of the virtues in our lives. God also produces the sun, the rain, and the warmth that is needed for our growth. But, analogously speaking, we must allow ourselves to be pruned. We must also allow the soil to be fertilized and cultivated in a variety of ways. 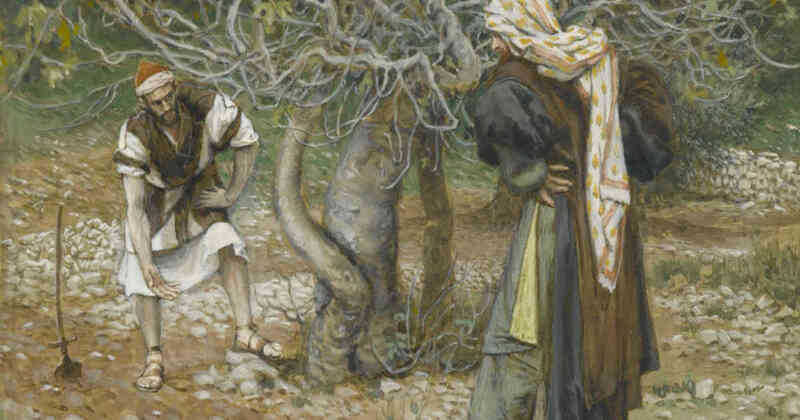 Though Jesus is the Gardener of our lives, it’s also fair to say that we are the gardeners in the sense that we must cooperate with our Lord, relying upon the supernatural resources of the Creator to ensure the healthy growth of our spiritual lives so that the good fruit of virtue may be born in our lives. 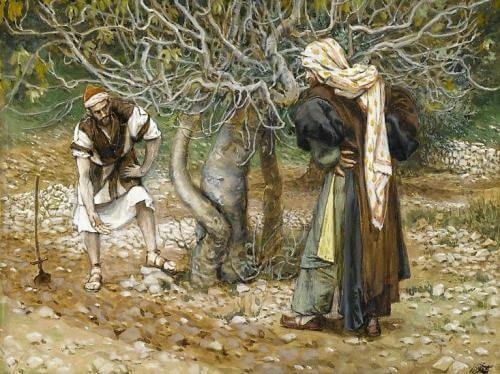 This passage above is the conclusion to the Parable of the Fig Tree. Just prior to this passage, the owner of the vineyard, God the Father, ordered that the barren fig tree be cut down so that it will no longer exhaust the soil. But our merciful Lord, sent on mission from the Father to till the soil of our lives, seeks to offer one more chance and the Father obliges out of love. This life is that “year” by which our Lord works fervently to cultivate the soil around us. We must cooperate through daily prayer, fidelity to His commands, acts of loving sacrifice and surrender to His providence. In the end, if we allow our Lord to do all He desires, our lives will bear good fruit. But on the flip side, make no mistake about the fact that, if our lives do not bear good fruit, we will be “cut down.” Bearing good fruit is not an option, it’s a must. It’s a clear indication of our spiritual health and it will become the measure of our eternal reward or eternal death. Do not be intimidated by such sharp language coming from our Lord. He spoke it in love so that we will know the serious duty we have to bear good fruit in our lives. Reflect, today, upon the outward signs of your inward spiritual health. Do you see the virtues sprouting forth from your life? Are you aware of the work God desires to do in your soul so as to cultivate it and fertilize it with grace and mercy? Say “Yes” to Him this day and allow that grace to produce an abundance of good fruit. Lord, I invite You into my soul to cultivate it and to fertilize it with Your grace. Please prune my sins and help me to sink my roots deeply into the nourishment of Your mercy. I am sorry for the ways that I have failed to bear fruit in my life. I now entrust myself to You so that Your care will remedy all my ills and weaknesses. Jesus, I trust in You. This is the story of a woman who encountered Jesus at the well. She comes to the well in the middle of the noonday heat so as to avoid the other women of her town for fear of encountering their judgment upon her, for she was a sinful woman. At the well she encounters Jesus. 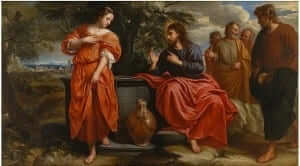 Jesus speaks with her for a while and she is deeply touched by this casual but transforming conversation. She wasn’t only impressed that Jesus knew all about her past as if He were a mind reader or magician. There is more to this encounter than the simple fact that Jesus told her all about her past sins. What truly seemed to touch her was that within the context of Jesus knowing all about her, all the sins of her past life and her broken relationships, He still treated her with the greatest respect and dignity. This was a new experience for her! We can be certain that she would have daily experienced a sort of community shame. The way she lived in the past and the way she was living at the present was not an acceptable lifestyle. And she felt the shame of it which, as mentioned above, was the reason she came to the well in the middle of the day. She was avoiding others. But here was Jesus. He knew all about her but wanted to give her Living Water nonetheless. He wanted to satiate the thirst that she was feeling in her soul. As He spoke to her, and as she experienced His gentleness and acceptance, that thirst began to be quenched. It began to be quenched because what she really needed, what we all need, is this perfect love and acceptance that Jesus offers. He offered it to her, and He offers it to us. Interestingly, the woman went away and “left her water jar” by the well. She never actually got the water she came for. Or did she? Symbolically, this act of leaving the water jar at the well is a sign that her thirst was quenched by this encounter with Jesus. She was no longer thirsty, at least spiritually speaking. Jesus, the Living Water, satiated. Reflect, today, upon the undeniable thirst that is within you. Once you are aware of it, make the conscious choice to let Jesus satiate it with Living Water. If you do this, you too will leave the many “jars” behind that never satisfy for very long. Lord, You are the Living Water that my soul needs. May I meet You in the heat of my day, in the trials of life, and in my shame and guilt. May I encounter Your love, gentleness and acceptance in these moments, and may that Love become the source of my new life in You. Jesus, I trust in You.